Updated to reflect all the latest taxonomic data, American Museum of Natural History Birds of North America is the complete photographic guide to the 657 species of birds found in the United States and Canada. Ideal for the armchair bird enthusiast or dedicated bird watcher, this book includes stunning full-color photographs revealing 657 individual species with unrivaled clarity. The 550 most commonly seen birds are pictured with plumage variations, and images of subspecies and information on similar birds are provided to make differentiation easy, from game birds and waterfowl to shorebirds and swifts to owls, flycatchers, finches, and more. You can even discover which species to expect when and where with up-to-date, color-coded maps highlighting habitation and migratory patterns. 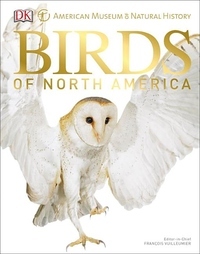 Written by a team of more than 30 birders and ornithologists with expertise in particular species or families, and produced in association with the American Museum of Natural History, this updated and refreshed edition of American Museum of Natural History Birds of North America is the ultimate photographic guide to every bird species in the United States and Canada.